Earlier this month, U.S. Translation Company (USTC), visited the families of the Ronald McDonald House Intermountain Area (RMHC) to participate in their “Adopt a Meal” program. This program invites friends, families, co-workers, school, community or church groups to cook meals for families with a seriously ill or injured child staying in Salt Lake City area hospitals. 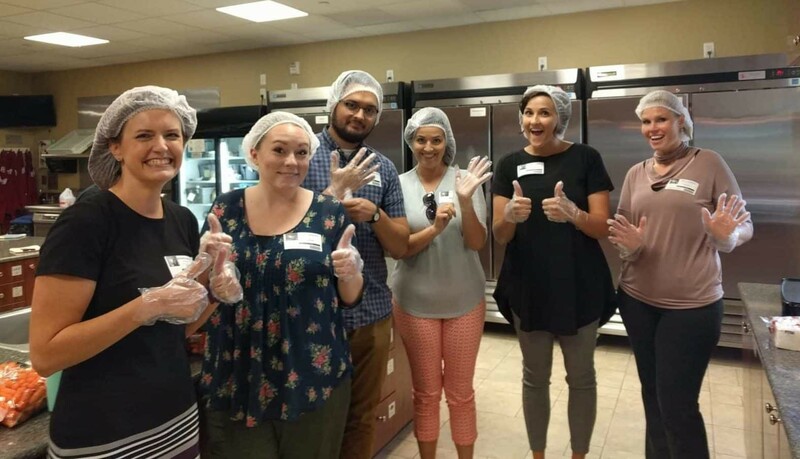 The USTC team, aiming to bring comfort and joy to the residents at RMHC, landed on the fine choice of making grilled cheese and tomato soup for their turn in the kitchen. Since meals must be prepared at the house, the lunch service was broken into two waves – one to prepare the meals and get them started and a second wave to continue cooking and clean up. Unless someone has a first-hand account of staying in a hospital for an extended period away from home, it is enlightening to help and support those going through such an experience, even if it is as simple as making lunch. “It’s great to know we are helping families that are under a lot of stress by providing a hot meal. We get to spend time together outside of the office and can interact with the families that are staying at the Ronald McDonald House. Even though they are in a tough situation, everybody is always very friendly and appreciative of our efforts. It’s a great way to give back to the community,” said Karen Stevens, Account Manager. The Ronald McDonald House is always eagerly looking for Adopt-a-Meal volunteers to help them create a “home away from home” by providing meals for families whose children have life-threatening illness. Since 1988 Ronald McDonald House Charities of the Intermountain Area has been keeping families close in a place that feels like home – providing stability and resources when they need it most. The mission of Ronald McDonald House Charities of the Intermountain Area (RMHC) is to surround families with the support they need to be near and care for their seriously ill or injured children. They provide a home-away-from-home to ease daily burdens and empower families of hospitalized children with meaningful experiences and quality time together. RMHC is committed to providing exceptional programs for families with seriously ill or injured children with fiscal responsibility, accountability – and thoughtfulness.